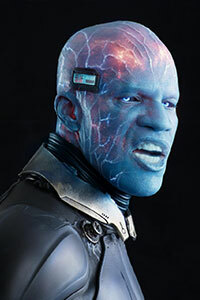 Supervillain Electro came into being when electrical engineer and linesman Maxwell Dillon was struck by lightning while repairing a power line. The ensuing shock changed him mutagenically, giving him powers that enable him to control electricity. After stealing electrical equipment from Stark Industries in an effort to further boost his power, he took the name Electro and became a professional criminal.